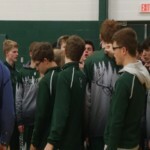 LEROY – Pine River captured its 10th straight district championship with a win over Evart in a Division 4 district final on Wednesday. The Bucks recorded a 64-13 win over Mason County Central in a semifinal earlier in the evening before posting a 68-7 victory over the Wildcats. 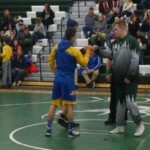 Pine River will now host a regional on Wednesday, Feb. 13. The Bucks will face Mancelona in a regional semifinal. The Ironmen recorded wins over Frankfort (47-33) and Traverse City St. Francis (66-6) on Wednesday to win their district. Pine River captured its 10th straight district championship with a win over Evart in a Division 4 district final on Wednesday.